In the summer 2010 issue of Modern, Editor Gregory Cerio, makes an interesting observation about work at SOFA (the Sculpture, Objects and Functional Art exposition) and the Cooper-Hewitt National Design Museum’s Design Triennial. In Surprised by Sincerity, Cerio admits that he was skeptical of both (despite some fine pieces at the first SOFA he attended, “a voice in the back of my mind kept whispering words like ‘macrame’ and ‘patchouli oil’ “), but writes that his “travels through the leafy glades of the high-end design market have forced a reassessment.” At “fashionable fairs” and “tony galleries” he has seen works “done with a smirk, or of design by irony.” Cerio says that he has to come to realize that at SOFA and the Cooper-Hewitt, by contrast,”they are presenting work made with honesty and conviction.” To read the entire editorial, get a copy of Modern at http://www.idealmodern.com/2009/11/modern-magazine-is-available-at-below.html. 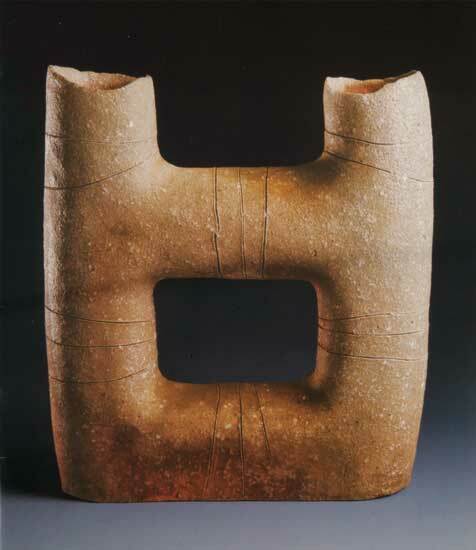 Among the artists whose work browngrotta arts will feature at SOFA West 2010 in Santa Fe this July 7th-11th is ceramicist, Yasuhisa Kohyama of Japan. Kohyama, a renowned Shigaraki potter who uses ancient techniques to explore new forms, gained widespread attention in Japan in the 60s when he built one of the first anagama kilns since medieval times. The Tokyo exhibition of works from the first firing of the anagama created widespread interest in Kohyama’s work, with famous potters such as Shoji Hamada visiting the exhibition. Collectors and museums were quick to acquire his works, including the Metropolitan Museum of Art, the Cleveland Museum of Art, the Stedelijk Museum in Amsterdam, the Gardiner Museum of Art in Toronto, the Philadelphia Museum of Art, the Museum of Art and Craft in Hamburg and the Shigaraki Ceramic Cultural Park in Shiga, Japan. collectors Alice and Halsey North and curator Joe Earle. “…[F]orm is the aspect of Kohyama’s work that most impresses the viewer,” Robert Yellin wrote in the Japan Times. “Some pieces are curled up slabs with an ‘inner sanctum.’ Others are broad expanses with wavy sides where their creator sliced them like a wedge of cheese. In these pieces we can see the radiance of Shigaraki clay: one side pitted with quartz stones, the other face matte, sharkskin-textured. A few do balancing acts, looking as if they might topple over at any time; others resemble clay wings, in which we can ‘feel’ the wind. His sake flasks are in a kamo-dokkuri (duck form), although they actually look more like turtles. They also make the most fabulous ‘tok-tok-tok’ sound when sake is poured from them, and as any sake vessel connoisseur knows, such an accent is of utmost importance. The artist will attend the opening of SOFA West 2010 on July 7th.